Have you got an idea that will benefit the community but no way of funding it? Why not crowdfund it. 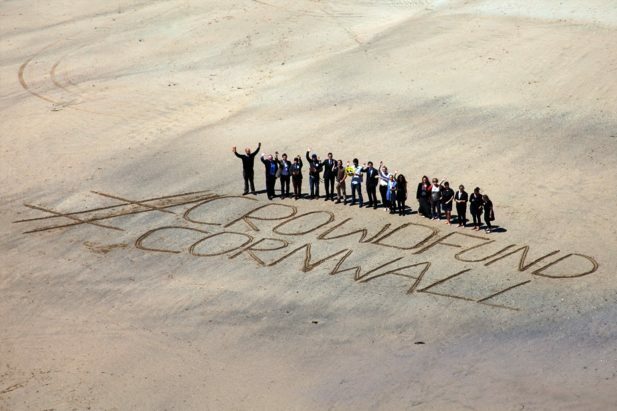 To date The Crowdfund Cornwall Campaign has raised over £50,000 for a number of projects all over the Duchy and since teaming up with the Cornwall Community Foundation are eager to raise much more. Crowdfunding is one of the fastest growing alternative methods of funding, with businesses, schools, community groups and individuals using the online platform to ask the crowd to support their projects. To crowdfund a project the project owner launches their campaign on Crowdfunder.co.uk where they ask for a set target of money, they then offer a number of rewards in return for pledges, these are more often than not products or services. The project owner then promotes their project to get people to pledge from as little as £1. In a special partnership with Crowdfunder the Cornwall Community Foundation is offering up to £50,000 worth of match funding to Crowdfunder projects. Individual grants up to £1,000 to projects that benefit the community will be added to the crowdfunding campaigns the individuals are running. The project owner must first meet their crowdfunding target to be entitled to the match funding. The crowd have already got behind The British Longboard Union who sent Newquay based surfers Ben Skinner and Adam Griffiths, who crowdfunded £5,000, to the ISA World Longboard Championships in Peru. Team GB finished fifth in the World and Ben Skinner went on to win silver. Another £5,000 was raised to keep the Cornish Language radio alive and running. The crowd got behind business start-up Got Game, and helped Tom Forster raise over £3,000 for his food enterprise. The crowd also supported Josie Purcell with her pop up darkroom, Shutterpod. Phil Geraghty, Crowdfunder MD, said: “We have helped thousands of projects all over the UK raise money from the communities around them, but being based in Cornwall we are passionate about helping projects in the Duchy”. Crowdfunder.co.uk provides people with an idea, an alternative means of funding, that steps away from the all too traditional routes of banks, loans and grants. Crowdfunder allows individuals to pledge money to the projects they really believe in. Crowdfunding really is for anyone, shown when the UK’s youngest crowdfunder at only seven years old used the platform to fund his own recipe book. Project owners are provided with all the tools they need to get their project up and running, including marketing and social media plans. The projects then have between four and eight weeks to raise their set target amount. Crowdfunder is an all or nothing platform so if the financial target is not reached no money is received and the backers get refunded. Rewards are offered in return for pledges and individuals pledge their preferred amount next to the reward they most fancy. It is free to add your project to Crowdfunder. We are looking for projects that benefit the community whether it be an event, a theatre company or school project – we want to hear from you. Everyone has an idea that they may find the funds to go on and do but the Crowdfund Cornwall Campaign allows everyone to have a go at funding theirs. Source FM is a volunteer led community radio station based in Penryn, who joined the Crowdfund Cornwall Campaign to raise £4,000 for a new radio transmitter – which they did. The Source FM campaign made the headlines and successfully reached target with 114 backers. The community is vital to this radio station and the online platform allowed the station to reach out to their community and ask them to donate money. Recording sessions, the chance to DJ and t-shirts designed by local artist Cosmic Jarvis, were all offered as rewards in return for pledges. Tom Forster is the owner and founder of food enterprise Got Game, Tom successfully raised over £3,000 thanks to Crowdfunder. Got Game was founded in 2012 and aims to bring Cornish wild game to the street and food festival market. Got Game was predominately funded with Tom’s own personal savings, after appealing for one too many bank loans and being refused funding Tom looked to the crowd. Tom managed to secure match funding from outdoor catering business Big Green Egg to the value of £1,500. Josie Purcell from St Agnes is the idea maker behind mobile darkroom Shutterpod. Josie successfully raised over £1,000 for her community darkroom. Josie aims to create accessible and interactive vintage photographic opportunities for all. The Shutterpod mission is to encourage self-belief through photo-art, ensuring anyone can enjoy being creative at alternative processing workshops that can be simple or more complex. By mixing vintage photographic ‘magic’ with a mobile darkroom, ShutterPod hopes to help people discover latent talents or develop current skills.